So, a little background on this… Back on December 23, the online specialty magazine After Elton ("News, Reviews & Commentary on Gay and Bisexual Men in Entertainment and the Media") ran a piece called Best. Gay. Decade. Ever., in which editor Michael Jensen enthused about his top 10 out-and-proud men of the decade. Below the piece was a standard Internet poll, where readers could pick their favorite among the people on the list, plus several others. 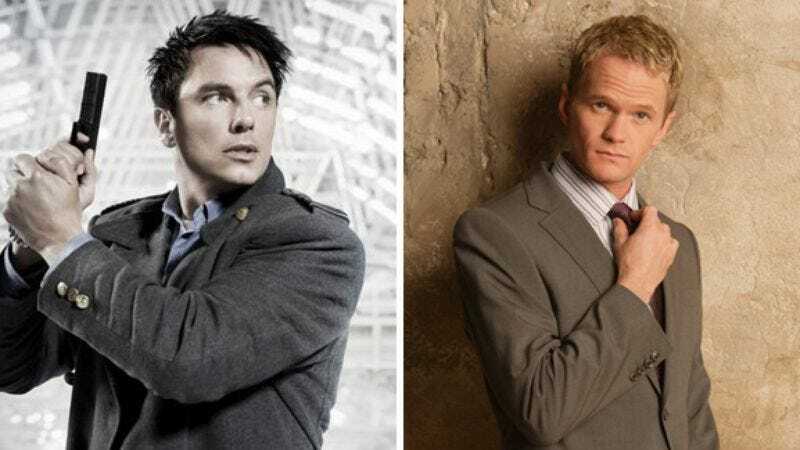 On that list were John Barrowman (currently known as Captain Jack Harkness on Dr. Who and Torchwood) Neil Patrick Harris (known variously as the former Doogie Howser, the hilarious self-parodist in the Harold And Kumar movies, or as Barney Stinson, the best thing about the CBS sitcom How I Met Your Mother). According to the increasingly extensive updates posted on the site, the poll ticked along unremarkably through the holidays. On Jan. 1, they posted an update saying that only about 20 votes separated Harris and Barrowman. Harris then Tweeted a brief call for votes to his 200k Twitter followers. Barrowman responded with his own call for votes, to his much smaller Twitter base. Then popular British talk-show host Jonathan Ross put out a call to HIS 500k Twitter followers, asking them to vote for Barrowman. Harris responded by getting Dr. Horrible's Sing-Along Blog co-star Nathan Fillion to stump for him. The whole thing went viral, and just about every celebrity (and non-celebrity) on Twitter started taking sides, with After Elton gleefully chronicling who all was getting involved: Alyssa Milano, Felicia Day, Neil Gaiman, Alyson Hannigan, Chris Hardwick, and a whole bunch more. Needless to say, the site has extended the voting deadline repeatedly to take advantage of the hoopla, and no doubt the extra traffic and attention. The site has been coy about how many votes each side is getting, while pointing out that the Twitter followers of the people on both sites amount to around 7 million people total. You can register your own vote through midnight at any of the After Elton blog posts linked above. Or put yourself above Smith, Hilton, et. al. and write in your own damn candidate. Or ignore the whole thing and wait for the next imbroglio to heat up Twitter and divide the celebrity world.